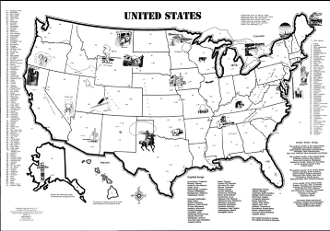 Our Products >> USA Map (Project Map to Label and Color) 25"x36"
USA Map (Project Map to Label and Color) 25"x36"
25"x36" black and white project map to label and color. Contains lyrics of the States and Capitals Songs and 172 items to label. CLICK HERE TO SEE CLOSE UP PDF.